Cuisanaire rod stairs designed and built by Tera which later morphed into a play area and was crashed by Superman who you see lying in the corner. Tera made Daniel this "Bibleman" bracelet. Some of Tera's bead work. I think sometimes as mothers we feel guilty about a great deal of things. Are we being selfish or too selfless? Do we discipline enough or too much? To just name a couple. One thing I find myself beating myself up about is how much "quality time" I spend with my kids. I sometimes feel like I need to occupy their every waking moment with endless educational and rewarding life changing activities. Like that is possible. I saw firsthand today that kids today would act like kids of yesterday if we just let them. When we were growing up, our parents didn't provide entertainment for us all the time. They said "Go play!" and we did. We made up our own things to do. We have to be willing to let our kids do that. Lately, I have been letting this attitude of "entertaining my children" go and you know what- they come up with some great stuff on their own. Granny sent them $5 a piece this week and we let them go buy some things to play with. 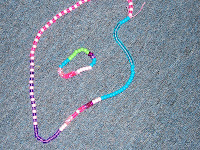 Tera got beads and string as you can see by her creations. 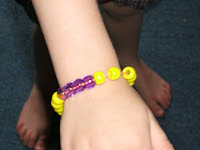 She made her brother a bracelet to match the colors of his favorite super hero - Bibleman. Daniel got a Superman play set in addition to a skateboarder dude playset Granny sent in the mail which has kept him entertained for 2-3 hours at a time. If you have young children, you know how much of a feat that really is. 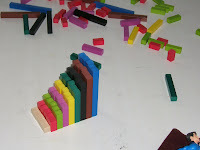 They also pulled out a set of Cuisinaire rods from the homeschooling stuff and starting building things. All of this without any prompting or intervention from their parents. Maybe our parents had the right idea to begin with. So tell your kids to "Go play!" and sit back and enjoy their creations without feeling guilty.